This game wasn’t one of Mahomes’ better performances on the season; in fact, it was one of his worst. His passing grade of 64.9 was lower than any other game he has played in this year. A lot of that had to do with what the Patriots were able to do against the young quarterback in man coverage. Against man coverage schemes, Mahomes went just 9-for-17 with 70 yards, two touchdowns and an interception. Those statistics don’t exactly convey the extent of his struggles, though. Only six of those passes could be considered accurate or on the frame of the receiver despite an average depth of target of 8.6 yards, which is below his season average. Mahomes only had one big-time throw compared to two turnover-worthy plays in those dropbacks against man coverage as well. His passing grade against man? 47.2. Facing the Patriots’ zone coverage was a different story for the budding star. Mahomes had the highest passing grade of any quarterback in the NFL this season against zone coverage concepts, and it was no different against New England on that Sunday night. Against zone coverage, Mahomes went 13-for-15, 267 yards and two touchdowns with a massive four big-time throws and no turnover-worthy plays. That stat line could have been even better if not for a drop. 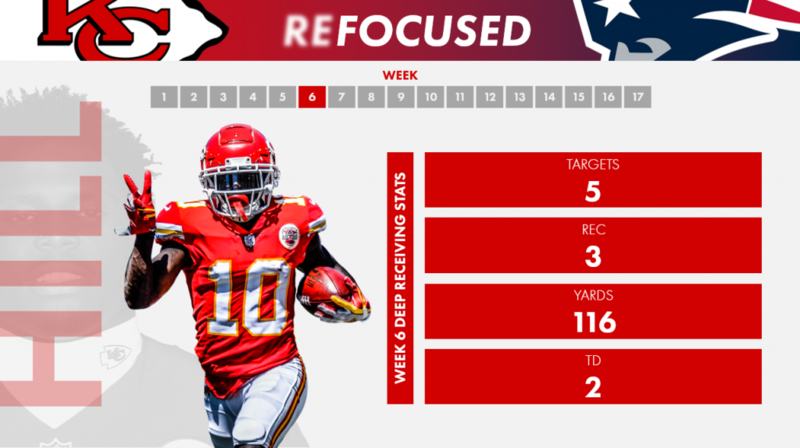 Unlike man coverage, Mahomes had his way with the Patriots in zone, which may prompt Belichick and company to attempt and lock up the Chiefs playmakers in man with their talented secondary in Round 2. The Chiefs have three elite pass rushers in Justin Houston, Dee Ford, and Chris Jones, and yet, they only got pressure on Brady on 23.7 percent of his dropbacks in their first matchup. That is well below their regular season pressure rate of 35.8 percent. 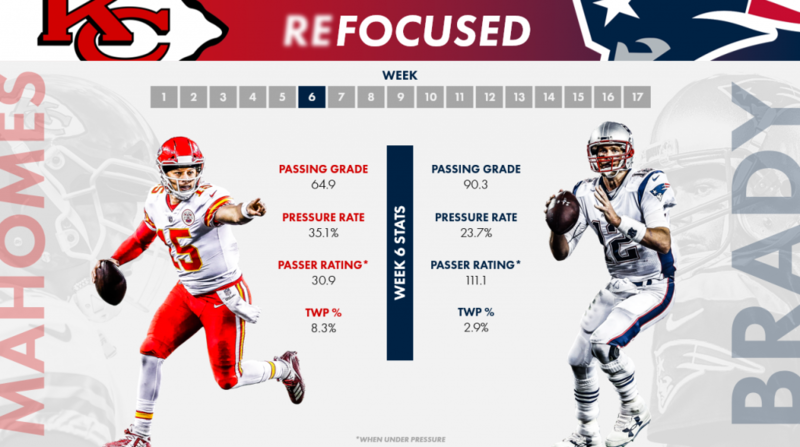 Houston did miss that game with injury, and his presence should make a difference, but it is imperative that the Chiefs get pressure on Brady. In that Week 6 matchup, Brady went 21-for-29 with 300 yards when kept clean. That equates to 10.3 passing yards per attempt and a completion percentage of 72.4 percent. Allowing him to work without pressure and choose his matchups is not a recipe for success. The Chiefs’ pass-rush will get a boost this Sunday in the return of Houston and the Arrowhead faithful behind them; they will have to use those additions to get better results than in the previous matchup in order to win. It’s not a new idea that Brady likes to attack the middle of the field with running backs out of the backfield, Julian Edelman in the slot and Rob Gronkowski at tight end. That doesn’t make it any easier for opposing defenses to stop week in and week out. In the initial matchup with the Chiefs back in Week 6, Brady went 11-for-13 for 171 yards when passing between the numbers. One matchup in particular that he exploited: Anthony Hitchens in coverage on James White. He targeted White in Hitchens’ coverage four times and all four passes were caught for 51 yards. Coming off a game in which he caught 15 passes last week, White should once again be a big factor in the offense. Three other Patriots recorded at least 40 receiving yards when lined up in the backfield, slot, or at in-line tight end – Edelman, Gronkowski and Chris Hogan. Kendall Fuller and the Chiefs’ linebackers/safeties will have their work cut out for them to avoid a repeat performance. Hill is faster than pretty much everyone in the NFL, a league filled with very fast people. This article from PFF’s own Mike Renner does a good job of explaining what makes him so dangerous. This section could be left at that, but to elaborate, the Patriots weren’t able to contain Hill when he went deep in the first matchup. He was targeted five times on passes 20 or more yards downfield, which he turned into three catches for 116 yards and two touchdowns. In all, Hill came away with seven receptions for 142 yards and three touchdowns. It’s easier said than done to take away the deep connection between Mahomes and Hill, but the Patriots will have to do a better job of it to win in Arrowhead. The Patriots finished the regular season with the third-highest team run blocking grade in the NFL. As a team, they averaged 1.9 rushing yards before contact per attempt, the fourth-best mark in the league. That was even higher in their first matchup against the Chiefs at 2.1 rushing yards before contact per attempt. Sony Michel finished the game with over 100 rushing yards, and the big guys up front deserve a lot of credit for that, albeit in a soft matchup. The Chiefs’ run defense was the second-lowest graded team run defense ahead of only the Tampa Bay Buccaneers. They especially struggled on first down, allowing a league-high 5.2 yards per rush on first down. Granted, that could be a design to entice teams to run since the league-wide average yards per pass play on first down is 7.3 yards. There are worse areas to be at the bottom of the league at than run defense, but being at the bottom of the league in any category isn’t a comfortable place to be.